Born in Sogndal, Norway, though raised in Portsmouth, Oregon, Cross grew up being mentored by the masked vigilante (and former physician) Doctor Mid-Nite — due to the fact that Mid-Nite had saved Cross’ own mother, just as Cross was born. 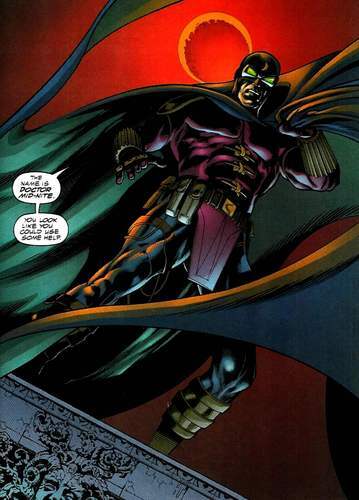 Pieter idolised Doctor Mid-Nite (whose real name was Charles McNider), as both doctor and vigilante, all throughout his life. Cross became a highly talented doctor, however, despite his skill he frequently got into trouble with the law — mostly for sticking his nose where it was not wanted, in order to ‘do good’. He also trained regularly in fitness and hand-to-hand combat just so he could tackle Portsmouth’s underworld more effectively, whilst giving medical care to the needy. Given a certain, rare skin condition, he only ‘consulted’ at night. People called him the ‘Midnight Doctor’. In the year that San Diego fell into the ocean, everything changed for Cross. Investigating a drug-ring (on his own) in Portsmouth, regarding a new steroid known as Decahydrabolin (or, on the street — A39), Cross was caught and dosed with an extremely high concentration of the experimental drug. He suffered a car accident as he fled, and lost his sight — but the drug triggered latent genes in him, revealing his metahuman heritage. Weeks after the accident, Cross was attacked one night by a young owl, and he angrily removed the bandages over his eyes. He discovered, to his astonishment, he could ‘see darkness’ (i.e. he described the moon as an inky-black disc in the night sky, but everything else remained ‘clear as day’). It was almost as if he had gained ‘negative vision’. There was more to it than that, and Cross also found he could see in all the lower-level spectra (normally invisible to the human eye, such as infrared and microwave), and the A39 steroid also enhanced his stamina, agility and strength to that of a superior athlete. Normal light, however, blinded him. Cross was forced to give up his medical license in order to hide the secret of his new ‘super-vision’. To preserve his identity as ‘Doctor Mid-Nite’, Cross changed his ‘day-job’ to that of writer (like his predecessor), assisted by Camilla Marlowe (a woman he had helped previously), who typed as he dictated. More than this, however, Cross returned to the streets at night. Inspired by McNider — and, in part, by the rumours of Gotham’s ‘Batman’ — Cross put his genius to use and designed goggles that allowed him to see (after a fashion) in daylight, which also augmented his ‘negative vision’ with embedded diagnostic software, and ultrasonic lenses. He trained the owl (naming him ‘Charles’) and created a number of useful gadgets to further aid him. Cross took his Hippocratic Oath very seriously, and designed his tools to be non-lethal, just as his fighting style was. Properly costumed and cowled, Doctor Mid-Nite (the second) took to the streets as a vigilante. 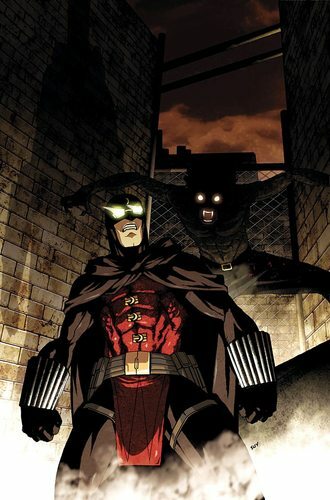 It has now been several years since Mid-Nite donned the cowl, and now (along with Marlowe), he plans to leave Portsmouth City, and move to Gotham, believing it is where he can do the most good. 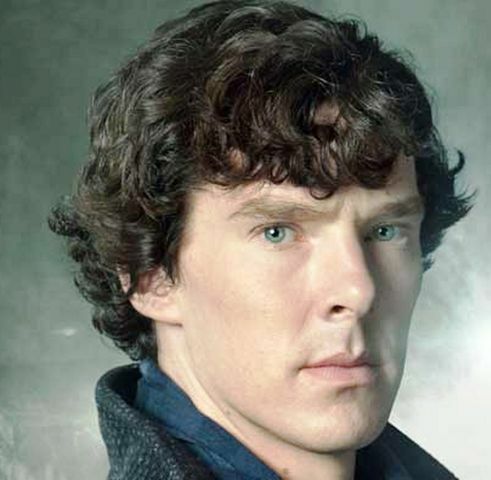 He intends to continue writing as a columnist (when not crime-fighting) and took the pseudonym ‘Lace Blackwell’ (based on two female doctors) for his articles. Cross is quite the thinker, to the point of being obsessive-compulsive. He has one of the most brilliant minds in the world, and he puts it to good use, however, he is prone to being too analytical, too pensive — brooding, that is — especially when a solution eludes him. He will not quit until he finds what he is looking for. Cross’ true passions lie in medicine, but that does not stop him from toying around with technology. He is no ‘Tony Stark’ as an inventor goes, but he will tinker with anything. Being a genius helps too. Cross is not entirely ‘all about’ law and order — he cannot abide ‘red tape’. If a law is not practical, it should be bent — so he bends it. This has gotten him into trouble before. Frequently. The law doesn’t protect everyone, which is why he does the practical thing — the necessary thing — to save those who ‘slip through the cracks’. He is more about the ‘spirit’ of the law, rather than the letter. Much like his predecessor, Cross is a religious man. He attends church regularly, and prays for the needy almost as much as he is out there, protecting them. Everything happens for a reason, and that faith sustains him. He is not generally an egotistical man, but his quiet and straightforward way of dealing with people can come across as… pious. His activities (especially when there are deaths involved) have him struggling with confession more often than he’d like. Cross won’t kill, not on purpose anyway. He values life highly and will go to great lengths not to take a life. He sees ‘heroes’ who kill as menaces, although the alleged ‘necessity’ of killing, at times, troubles him. He is also a vegetarian. A peculiarity of Cross’ psyche is sensory-crossover (synaesthesia). Basically, his brain translates sound into colour — which varies depending on emotion, pitch and resonance… This is one more reason that he loves music so much, and influences how he perceives and relates to his environment. Cross does what he does because he can — and therefore, must. 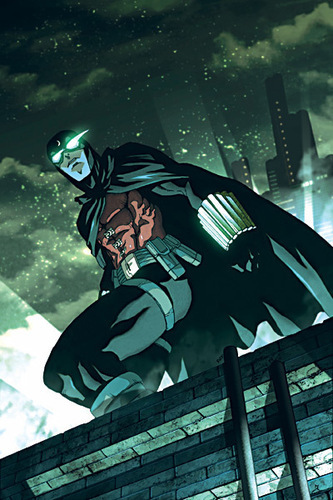 He has grown up his whole life with the first ‘Doctor Mid-Nite’ as a mentor, and added to his faith, this creates a particularly strong ‘guiding force’ in his life. He wants to honour Charles McNider. He wants to honour God. He wants to help the people that ‘the system’ seems to miss, or disregard. Someone has to reach them. Doctor Mid-Nite wants to see an end to crime — obviously. Of all kinds of crime, drug-traffic hits closest to home for him, and he wants to see it abolished. The same goes for the exploitation of the poor. He is particularly passionate about ‘freedom of information’, and uses his cover-id as another means of sharing knowledge. Above all else, he wants to prove himself worthy of the ‘Mid-Nite mantle’, and worthy of God. Cross has recently discovered he is a latent metahuman, and his encounter with the A39 steroid (combined with his accident) triggered his abilities — especially his sight. While he cannot see in the normal, visible spectrum of light at all, he sees perfectly well in darkness (the darker the better). As he puts it, ‘the lower light spectrum is mine’ — he can see the infrared spectrum, and visually track other forms of radiation. His night-vision is regarded as among the very best in the world. The A39 serum (a derivative of ‘Venom’) also enhanced Cross’ strength, stamina and agility to ‘olympic athlete’ levels. While he is not the equal of heroes such as Captain America, or Batman, he can contend with most unpowered humans with relative ease. His hand-eye coordination surpasses the norm (but would not exceed that of, say, Bullseye). 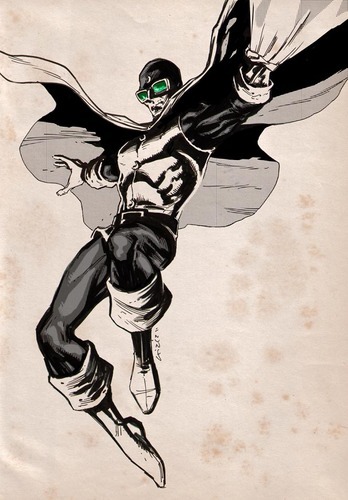 Designed and built by himself, Mid-Nite’s goggles enhance his ‘negative vision’ even further — they allow him to continue to see in daylight (infrared), artificially convert sonic-waves into visual representations, and provide detailed analyses of everything he sees and hears (such as bio-scans of injured subjects) in a HUD. He can generally tell if someone is lying to him. There is an emergency “Flare-Flash” feature that is bright enough to pierce the darkness of his Black-Light Bombs, and temporarily (with the risk of permanently) blind anyone in front of him, or looking at him. 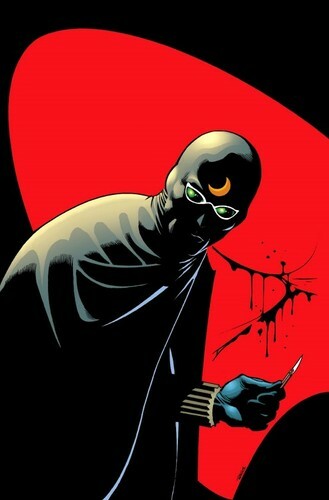 Mid-Nite’s costume is made from a light polymer that will turn most blades, and stop small calibre bullets. The armour is strongest at his chest, back, gauntlets and cowl, and conceals several useful ‘devices’ should he ever be caught without his more visible accoutrements. His outfit is also heat-resistant, and flame-retardant. Much like the more infamous crime-fighter, Batman, Mid-Nite carries a modest amount of highly advanced, compact gadgets with him. His gauntlets are even more reinforced than his costume to protect the variety of chemicals and medicines and multitools they contain. Retractable injectors, for example, allow him to incapacitate most attackers within seconds, or provide swift pain-relief, truth-serums, etc, to people. His belt sports even more gadgets (including a grappling gun, a multi-frequency ray-gun for stunning targets at a medium distance, tracking bugs, throwing discs…), almost all of it being non-lethal. Cross’ first and favourite creation is his Black-Out/Black-Light grenades — compact devices that simulate total darkness by releasing a rapidly-expanding compound that condenses into an inky mist, effectively blocking out all available light, and foiling most scanning equipment. One Black-Out Bomb could fill a large room, or an alleyway. As one of the best (if not /the/ best) physicians in the world, Cross has accumulated a modest fortune, and uses it to fund his own vigilante activities. He is far from being any sort of billionaire, but owns over a million dollars in assets easily. He does not have his own ‘cave’ or ‘fortress of solitude’, but his large home is fully equipped with a lab and operating theatre. He even has his own “virtual interrogation” set-up, combining computer-technology with his own knowledge of pharmacology. Several people (and one highly trained owl) work with Mid-Nite to help him in his superhero work. A select few of these (such as Nite-Lite, who serves as both medical assistant, errand runner and sometimes bodyguard, and Camilla Marlowe, who is also an assistant and tech-support) know Mid-Nite’s identity. Many others serve as contacts throughout the city for intel-gathering. Mid-Nite also works with a highly trained owl that he named Charlie, after his mentor. It should be noted, his current contacts are limited to Portsmouth City. In Gotham, Metropolis or anywhere else, Mid-Nite would be starting from scratch. 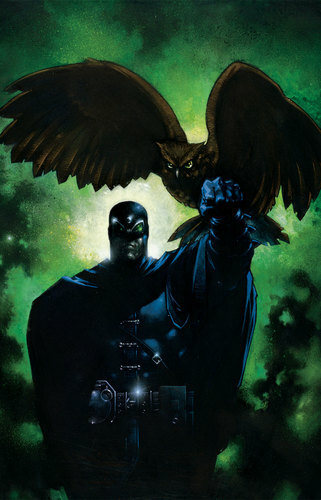 Mid-Nite’s owl-companion will respond to a variety of calls, whistles and other signals from Mid-Nite, and serves as a highly effective means of reconnaissance. Charlie has a tiny digital camera around his neck that feeds information directly to Mid-Nite’s goggles. The bird can/will attack on command, but is rarely ordered to do so. ”Door” is an artificial intelligence that serves as Mid-Nite’s home security system. It can monitor life-signs and other energy signatures all around the mansion and grounds, and activate a defence grid to either ward off, or capture intruders. Doctor Cross is highly intelligent — comparable to other people such as Tony Stark, Reed Richards, etc… He can make complicated equations, deductions and diagnoses in seconds, and has spent the years since his accident honing his other senses as well as his nightvision. He always approaches crises ‘with a plan’ in mind — even if he has to make it up rather quickly. Cross is well-known as having been one of the best physicians in the world (if not /the/ best), before his accident. To the general public now, Cross is a blind ‘has-been’, however, as Mid-Nite he frequently provides free-of-charge medical care (including impromptu surgeries, and even autopsies for the police — after which he leaves notes on what he found) to those who need it. He is highly competent in a variety of specialised fields, and is resourceful enough to employ his skills in the field. He could perform heart-surgery during an air-raid, in pitch black if need be. Somehow, Pieter Cross managed to convince perfect strangers to trust him, take his advice, and even allow him to provide medical care before he became ‘Doctor Mid-Nite’. He successfully infiltrated a drug ring that had the authorities thwarted at every turn, in Portsmouth City. Those people whom he helps usually agree to serve as his ‘eyes and ears’ throughout the less-fortunate districts of his city. 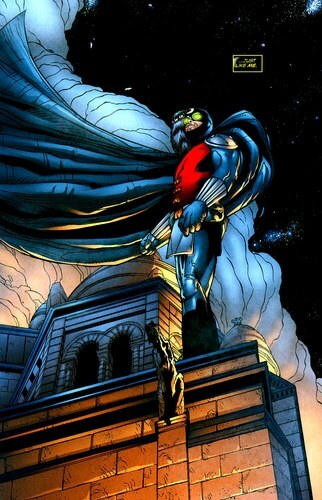 Cross was trained by his mentor, the previous Doctor Mid-Nite (Doctor Charles McNider) in several forms of unarmed combat, as well as the gymnastic art of parkour or ‘free-running’ to navigate the city (on foot if necessary, augmented by his utility tech) as effortlessly as possible. He would not (quite) be a match for combatants such as Batman or Daredevil, but he is not too far behind them. He favours styles that employ holds, pressure-points and misdirection (such as Wing Chun and Judo) — over straight-out battle. Cross is fluent in English, Norwegian, Italian and French. 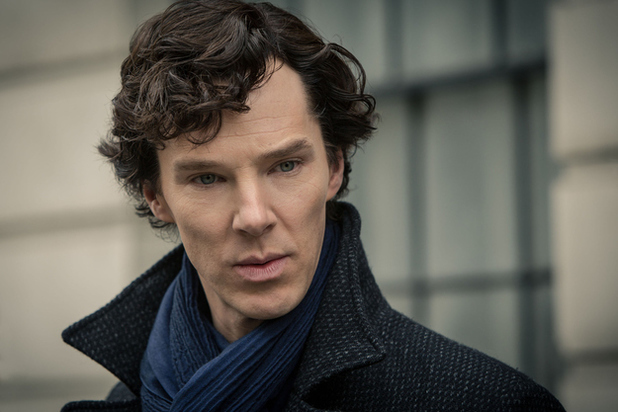 He has some knowledge of Old Norse, Swedish and Danish, and knows a little of Russian and Mandarin. Blindness Pieter Cross cannot see the ‘normal’ visible spectrum of light at all. In daylight, lamplight etc… he is completely blind, unless he is wearing his specialised Nite-Goggles that augment his infrared vision for daytime conditions. Because of his condition, he has had to give up being a ‘public’ physician, and switch to writing (by dictation). Obsessive-Compulsive Cross is meticulous in the way he works — to a fault. Partially due to his blindness, he keeps his house (especially his lab) perfectly organised, and he becomes ‘curt’ with people when they rearrange things. He has a habit of over-thinking and brooding, ignoring other people when something else is occupying his mind. Jaded While Cross is passionate about his own work, and the work of his fellow heroes (most of them, anyway), he is very disillusioned with ‘the powers that be’ (that being, government), as too often ‘good’ is defeated — not by ‘evil’ — but by RED TAPE. He holds the oaths he has personally taken in high esteem (such as ‘Do No Harm’, which is why he will not kill), but he view the ‘laws of the land’ as a reluctant ‘necessary evil’ at best, and a constant annoyance at worst. Everyone has one; Doctor Mid-Nite is no exception. He is especially incensed against drug-dealers, given the experiences he has had. Sometimes it is difficult to maintain a standard like “Do No Harm”, and he fears ‘slipping’. Xenoderma Pigmentosa Even before the overdose of A39 — and the car-accident that immediately followed — Pieter Cross suffered from a rare skin disorder that caused him to suffer a severe allergic reaction to direct sunlight. This is partly why he was known as the ‘Midnight Doctor’ before he became a superhero — he cannot go out in broad daylight (unless he is fully costumed up). Essentially… Pieter Cross is something of a vampire (minus the fangs, immortality and general ‘undeadness’)! His assistant, Camilla, suffers from the same affliction. Secret Identity The likelihood of someone figuring out that a blind ex-doctor is actually a crime-fighter might be slim, but still… should any nefarious types discover the truth about Doctor Mid-Nite, then it could go very badly for Pieter Cross. While Pieter Cross is well-known for having been one of the world's greatest physicians, it is also well-known he lost his sight in an accident and therefore does not practice medicine anymore. The vigilante, Doctor Mid-Nite, is well-known throughout Portsmouth City — especially for single-handedly taking down the nefarious Triumvirate within Praeda Industries and their plans to destroy the city. 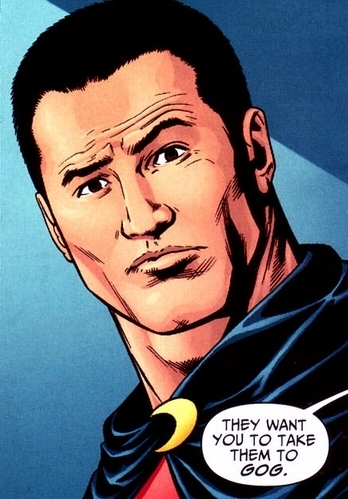 Since then, Mid-Nite has taken his 'mission of mercy and justice' to other cities (Gotham, in particular) and even other countries — thus, he is now 'on the radar' of several world-agencies (Justice League, S.H.I.E.L.D., etc…). They may or may not know who the Doctor really is, but they are aware of his activities.